Resources that have general interest about flooding, local surface waters and watersheds, and green infrastructure. Everyone lives in a watershed! A watershed is an area from which water drains to a common place, for example, Lake Michigan. Learn your watershed by entering your zip code at the US Environmental Protection Agency's Watersheds page, where you will also find information about using a watershed approach to planning and numerous educational resources. Is the quality of the water in your local creek, river or lake impaired? Illinois residents may find out at the Illinois Environmental Protection Agency's Water Resource Assessments page. Wetlands are nature's water filters. Many historic wetlands have been lost to development and drained for farming. Locate the remaining wetlands in your area with the Fish and Wildlife Service's Wetland Mapper. The Illinois Department of Natural Resources' Water Resources page has flood maps; information on flood insurance and dam and flood control projects; and a link to the Illinois Coastal Management Program. 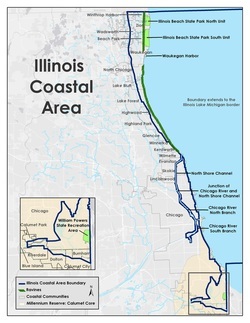 While stormwater runoff causes flooding and contributes to water pollution in urbanized areas everywhere, the focus of this project is the Lake Michigan watershed and segments of the Chicago Area Waterway System (CAWS), as defined by the Illinois Coastal Area seen in the map at left. the Lake County Stormwater Management Commission for Lake County. Each has adopted its own Stormwater Management Ordinance to minimize the impact of new development on flooding. Are you experiencing flooding at your home? The Center for Neighborhood Technology (CNT) offers help at the Rain Ready website. They offer fact sheets, videos, and information on a variety of topics, including buying flood insurance and preparing for a heavy storm. Urban runoff is a source of "nonpoint source pollution," meaning that it is generated by numerous, diffuse sources, rather than one specific source. Allowing green infrastructure to clean the runoff by replicating natural processes is a potent, cost effective approach to mitigate the pollution. The US EPA Green Infrastructure site includes information on case studies, costs and benefits, federal funding sources, and tools such as sizing and cost spreadsheets. It houses the National Stormwater Calculator which helps homeowners determine the likely impact on runoff of various practices, based on the specific attributes of their properties. See real life examples of green infrastructure in Chicago's North Shore communities in a post on the Ecowren blog.